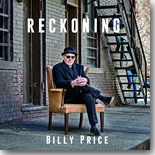 Bluesy soul singer Billy Price teamed up with Kid Andersen at the latter's Greaseland studios, a collaboration that took the singer's music to a new level. The result is Reckoning, this month's Pick Hit. Guitarist Breezy Rodio has backed many Chicago blues greats both on stage and in the studio, but he gets to step to the front of the bandstand on this new Delmark recording, Sometimes The Blues Got Me, our Surprise CD of the month. This month's Flashback features a new collection of 30 hits from influential Louisiana guitarist Guitar Slim, covering recordings released on Specialty, Atco and Imperial Records. Our What's New section features new CDs from Elvin Bishop's Big Fun Trio, Buddy Guy, Kid Ramos, Teresa James and the Rhythm Tramps, Rockwell Avenue Blues Band, Peter V Blues Train, Kathy & the Kilowatts, and more.